Make a set of numbers that use all the digits from 1 to 9, once and once only. Add them up. The result is divisible by 9. Add each of the digits in the new number. What is their sum? Now try some other possibilities for yourself! In turn 4 people throw away three nuts from a pile and hide a quarter of the remainder finally leaving a multiple of 4 nuts. How many nuts were at the start? Every row, every column and every $3\times 3$ box in the grids contains the digits $1$ through $9$. The puzzle can be solved by finding the values of the unknown digits (all indicated by asterisks) in the squares of the $9\times 9$ grid. At the bottom and right side of the $9\times 9$ grid are numbers, each of which is the Least Common Multiple (LCM) of a column or row of unknown digits marked by asterisks. Altogether $18$ Least Common Multiples of $9$ columns and $9$ rows of unknown digits are given as clues for solving the puzzle. As an example, the LCM of $3$, $9$, $6$, $4$, $2$ and $1$ is $36$. In the puzzle, the LCM of the four unknown digits in the second column beginning from the left of the $9\times 9$ grid is $36$, while the LCM of the four unknown digits in the seventh row beginning from the top of the $9\times 9$ grid is $120$. 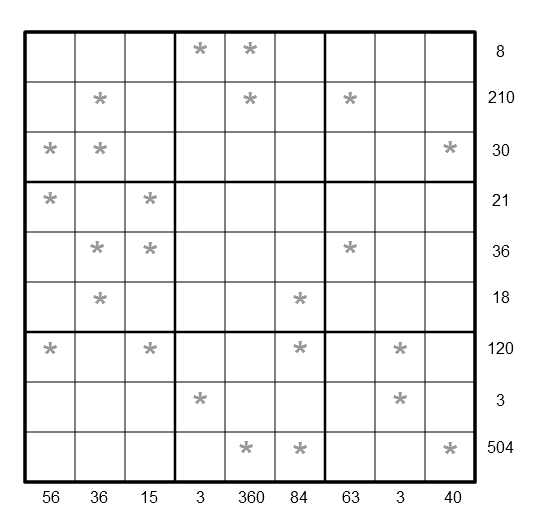 After finding the values of all the unknown digits, the puzzle is solved by the usual sudoku technique and strategy. Creating and manipulating expressions and formulae. Combinatorics. Mathematical reasoning & proof. Simultaneous equations. Modular arithmetic. Visualising. Networks/Graph Theory. Factors and multiples. Working systematically. Indices.